Well folks, the topic on everyone's mind lately is the new banned and restricted list update from the DCI. Sensei's Divining Top got banned in Legacy because Miracles was the absolute best deck for far too long (and top-spinning eats up tournament rounds like nobody's business). In Vintage we got a few updates as well. "In Vintage, the metagame has come to a bit of a standstill as Monastery Mentor decks face down their main predator, Workshop decks. The primary issue seems to revolve around the prevalence of free draw spells for the Mentor deck that let it churn through its library for no mana while creating an abundance of tokens. We believe by removing these free draw spells—and the perfect information that comes with Gitaxian Probe—we will significantly weaken Monastery Mentor–based strategies. Hopefully the move away from "free" spells in the Mentor decks will lessen the impact of the Workshop deck's various Sphere of Resistance effects, opening up the metagame." In my opinion Gush is the more important restriction of the two cards, so I'd like to discuss that one first. For those of you that don't know, here are some facts about Gush. First of all, Gush has been restricted twice before. Vintage is the only format that allowed players to play Gush as it has been banned in Legacy for a long time. Drawing two cards for no mana is very good, and although Gush technically has a drawback built into it, that drawback can be turned into an advantage. 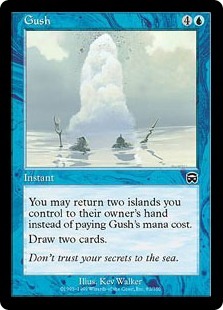 Anyone who has played Vintage for even a short time knows that the alternate cost of Gush (returning two Islands to your hand) is only a drawback if you play the card incorrectly. 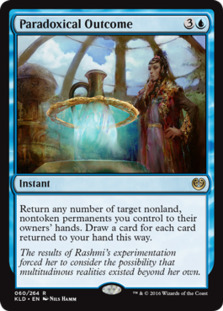 By playing a deck with a smaller mana base and sequencing your land drops properly you can actually produce more mana with Gush and draw fewer superfluous lands in the process. This deck design is the basis for the Turbo Xerox principles that have influenced deck design for nearly two decades. The fact that Gush grants two extra cards for no mana is the real reason that it is restriction-worthy. The article from Aaron Forsythe specifically mentions Monastery Mentor as the reason they hit Gush (and Probe), but I sincerely believe that restricting Mentor wouldn't have made Gush any less of a problem. Gush was the best thing you could be doing if you were playing the color blue, and blue happens to be the most played base color in Vintage. The arms race of blue mages fighting each other requires that people play spells like Gush just to stay at or around card parity. 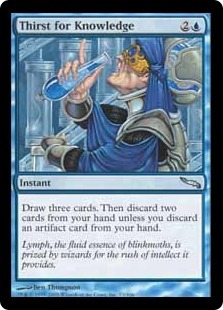 This phenomenon of blue cannibalization is also responsible for things like main-deck Pyroblast and the four Mental Missteps seen in nearly every blue deck, Many of the cards that people are forced to play to fight the blue pseudo-mirror range in quality from terrible to not-that-great when facing non-blue decks (mostly Workshops and similar strategies). The thing I like about the latest Gush restriction is that it shows, in my opinion, that the DCI is at least trying to pay attention to Vintage. Not every Vintage player agrees with this restriction, but the vast majority of players that did support a Gush restriction did so because of basically the same reasons that Aaron Forsythe mentioned. With Gush gone players are free to play with different draw spells and higher land counts. People can play basic lands besides Islands in their main deck to hedge against Wastelands now. You might even see non-blue dual lands being slightly more relevant now that your average blue mage doesn't need to cast Gush. The types of blue decks that traditionally had good matchups against Workshops were usually pretty awful against Gush. Landstill and Oath of Druids both were quite solid when facing down a Prison-style deck but they tended to lose to Gush. Obviously there were exceptions to this; Landstill won the last Vintage Champs and Oath won the two Vintage Champs prior to that. However, when you look at the overall performances of blue decks in paper and online it's hard to dispute that Gush was by far the best performing archetype in blue. This restriction seemed a little odd to me at first as Probe doesn't have any effect on the board, nor does it create card advantage. Even though this effect isn't as pronounced as a card like Ancestral Recall, the information that Probe provides does create a distinct and powerful advantage. What really made Gitaxian Probe broken wasn't the effect though. You don't see people clamoring to put copies of Peek into their deck. The problem with Probe centered around Phyrexian mana. Early in a game the two life points spent to free-cast Probe are of no consequence, and that perfect information made combo decks even more brutal. Gitaxian Probe, much like Brainstorm, Ponder, and Preordain can be an important part of a Turbo Xerox-like mana base. Replacing extra lands with cantrips creates fewer dead draws as games go on, as lands are useless past a certain point. 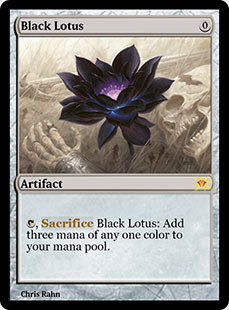 The free nature of Probe makes this even more pronounced though, as it draws a card with no mana investment. Think of it this way; on turn one if you played Preordain you probably used up all or most of your mana for that turn. Gitaxian Probe doesn't dig as deep as Preordain but it does allow you to leave mana open for something else. Being able to cast Probe and realize you can safely resolve a key spell is incredibly powerful. The Phyrexian mana cost of Probe also creates degenerate interactions with Monastery Mentor. The tokens that a Mentor creates are incredibly problematic, and if you can create even one or two tokens before your Mentor dies that might be enough to close out a game. When you have a deck with four Probes (and four Gushes) it's trivially easy to create a flurry of tokens immediately after resolving a Mentor. What do these changes mean for Vintage? Truthfully it is hard to say with certainty about what will happen in the wake of these two restrictions. Some people seem to think that Monastery Mentor is dead. I will tell you that I would bet the farm that is not the case. Young Pyromancer is probably not going to see any play in the coming months, and it may never become popular again. However, Young Pyromancer has been outclassed by Monastery Mentor for a long time. Mentor didn't need Gush to be broken. People have won or made Top Eight with Monastery Mentor decks that used Thoughtcast, Paradoxical Outcome, or even Thirst for Knowledge. Pyromancer and Mentor might seem similar on the surface, but the fact is that Young Pyro is relatively fair and Mentor is a degenerate card. The fact that Monastery Mentor triggers from any non-creature spell in your deck makes it far more powerful than Young Pyromancer ever thought of being. 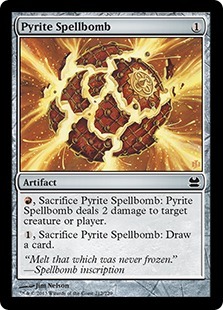 The only thing that Pyromancer ever had over Mentor was that it was slightly cheaper to play. My prediction is that we'll see the Paradoxical Outcome and/or Thoughtcast Mentor decks take over the metagame share that Gush Mentor used to occupy. Perhaps we'll see a resurgence of Bomberman (Auriok Salvagers Combo) Mentor decks as well. It's tough to say. I'm placing my bet on Paradoxical Outcome though because it's a deck that was already putting up results. My other prediction is that Oath of Druids gets a lot better. Ravager/Ballista Shops is one of the top decks in the format and there's no better way to fight it than two-mana Griselbrand. The one caveat is that Mentor decks naturally have access to Containment Priest, so if those decks go back to running four Priests in their sideboard it could keep Oath from being better than it otherwise would. I know that some people are probably disappointed with these restrictions, and I can completely relate to that. The two Vintage decks that I had in my paper collection both ran Gush. I've played Gush quite a bit, and it honestly was one of my favorite cards. Unfortunately though, I must admit that the more I played this format the more I realized that Gush was leaps and bounds better than every other option available. I know some people might argue that Paradoxical Outcome was more powerful, but the results don't really show that. Paradoxical Outcome is even more susceptible to hate cards and effective counter strategies. 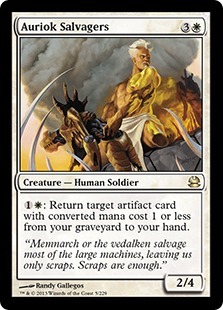 Paradoxical Mentor gets my vote for the best Mentor deck in the post-Gush era. 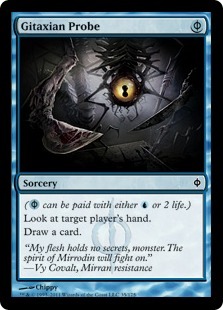 Mentor is actually more broken in a shell like this, but in some ways this type of deck is even more fragile against Prison elements, Cards like Null Rod and Sphere of Resistance are especially difficult for a Paradoxical Outcome deck to deal with, especially when the Outcome deck is on the draw. 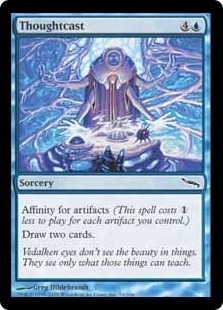 However, on the play, or when only facing one "Sphere effect," the extra artifact mana can help this style of deck to build up it's board of mana. If you can survive long enough to break out of the prison lock with a Hurkyl's Recall it's quite possible to defeat the opposition. When facing different blue decks, Paradoxical Mentor really shines. It isn't difficult to draw most of your deck after resolving one medium-sized Paradoxical Outcome. It's even possible to win on turn one with help from a Time Walk. I expect that the success of Paradoxical Mentor and Combo will probably lead to an increase of Stony Silence and Null Rod decks, but that remains to be seen. Oath of Druids decks are natural predators for Mishra's Workshop strategies. When the only thing that victory requires is that you resolve a single two-mana enchantment it's not hard to deal with a Thorn of Amethyst or two. Besides the traditional Griselbrand Oath deck above there are several viable archetypes that could see a resurgence. Bomberman Oath, Saheeli Oath, Odd Oath, and Landstill Oath have all seen varying degrees of success and they should all be slightly better than they were before. 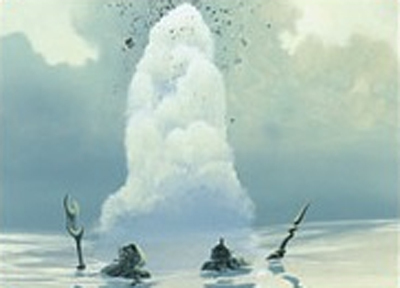 Big blue Mana Drain decks aren't very prevalent in Vintage right now, but that could change. Grixis Thieves was once one of the best decks in the format, and perhaps something similar could make a comeback. There are even more tools to support such a deck now that Paradoxical Outcome is around. Perhaps a more controlling and less combo-centered deck could blend the Paradoxical shell with the planeswalkers and Mana Drains of Grixis Thieves to create something new. It's tough to say whether or not any of the decks I've featured will succeed in the new meta, and if they do they'll surely have been tuned beyond what it listed above. It takes time for metagames to settle, and without much testing we're left with only theories and assumptions. The safest bets for successful decks in the first week will be non-Gush decks that have proven themselves prior to the change. I expect that means a lot of Ravager/Ballista Shops and Paradoxical decks with a little bit of fringe stuff here and there. No matter what your opinion of the latest restricted list changes is you have to admit that this is going to shake things up quite a bit. Gush wasn't just one deck; it was an archetype as far as I'm concerned. "The Pillars of Vintage" isn't something that is really relevant or accurate anymore, but Gush was as close to being a true pillar of Vintage as any one card ever was. Gush was the backbone of many different decks; from Doomsday to Fastbond Storm, to Pyromancer and Mentor. There have even been Gush decks that didn't play any of the cards I just mentioned and instead won via Moat and planeswalker activations. The truth is that the win condition didn't matter nearly as much as the gasoline that got you there. The Gitaxian Probe restriction will probably have a much smaller influence on things. My assumption is that fewer games will end with "Probe you, see nothing, go off" than they used to, and that's about it. Bluffing has always been important to Magic though, and it'll be nice to have that back in Vintage.